The debut album from this English band. 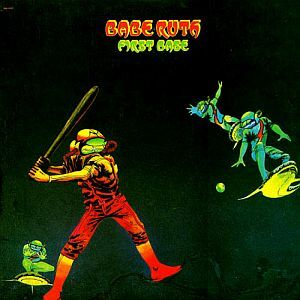 Babe Ruth was a band who released five albums between 1972 and 1976. In 2007, they also released a sort of a comeback album. The band is still touring these days after a 35 years long break. The band really only found moderate success in USA, UK and Canada before they split up. Today, I think it is right to call them a cult band. The likes of ProgArchives has given them a great deal more well deserved attention than they would have got without the internet. I am about to give them some more attention, too..... Deserved attention. One of their main asset, in fact their main asset was the vocalist Janita Haan. She was the big focus in this five piece band who also included a guitarist, bassist, drummer, organ and a piano player. Their style is basically hard rock. But that lays ahead because there is a lot more to this album than just hard rock. This album even includes a Frank Zappa cover (King Kong). There is plenty of hard rock here. But add a lot of blues'n'soul too. Even jazz and fusion too. There is a lot of funky things here too. That without being funk. Babe Ruth has a bit of their own style and sound. At least on this album. A sound where Janita Haan rule and really deliver a great vocal performance. And so does the rest of the band too. The sound is compact. The music has a lot of interesting details to offer. Add the fact that the six tracks on this forty-one minutes long album are really good too and you get a good album. A cult album too. Not at least because of the iconic cover art-work. This is an album I really will recommend. And this album has got the band a bit of a fan in me.